If you’re done with yoyo-dieting, diet shame and the restrict-binge cycle then you have arrived at the correct place. Your Best Body Weight-Loss is a program that is about sane and sustainable weight-loss. It is based on the science of how our habits influence our brain and eating behaviour as well as how the food we eat affects our biology and brain. I described in a previous post how True to Yourself Eating is different from dieting because it’s all about YOU. Your Best Body Weight-Loss combines the best aspects of mindfulness-based eating with the science of bio-individual nutrition. Addressing emotional eating and self-sabotage is important, but will only take you so far. 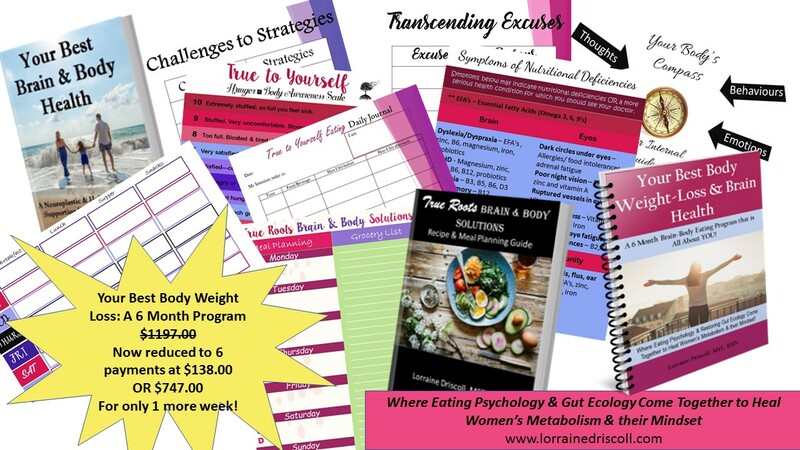 Your Best Body Weight-Loss program assists you in co-creating meal plans that are unique to your body type and lifestyle, trouble-shooting based on challenges and triggers that are unique to your life and helps you to find time for meal prep and self-care. Free yourself from overeating and cravings by getting to the root of dysfunctional eating. Burn more calories and increase energy and motivation by healing an injured metabolism with food therapy. Learn to make effortless food choices by understanding the neuro-addictive properties of food and how it affects the body’s ability to regulate appetite and cravings. *No weigh-ins, no calorie counting, no shaming! Below is a description of what the program will cover as well as the different topics that are covered in each module. ♥ Learn about the neuro-psychology of certain foods and eating, how they affect your body’s ability to regulate appetite and cravings, the addictive and therapeutic properties of specific foods. ♥ Overcome your emotional triggers, dysfunctional habits and the reasons why you self-sabotage. ♥ Design an individualized eating plan that is based on your needs, your body-type, your preferences and your intentions. ♥ Increase metabolism by turning off your F.A.T. Programs and tapping into your sub-conscious! ♥ Uncover what is absent from your life or what unfulfilled dreams are fueling the dysfunctional behaviours and thoughts. Learn to fill up on LIFE not food. ♥ Accomplish weight loss without restriction and deprivation. Willpower is finite. Learn self-love and skill power. ♥ Practice and improve strategies that foster healthy habits, instead of creating restrictions by layering new tools one week at a time. Your Best Body & Brain Weight-Loss program is a 6 month journey that has been carefully constructed into several phases which will allow you to layer new information, habits and strategies into your life. The phases are exploration, connection, application, reflection, troubleshooting and continuity.